I first saw the Domesday Book of Mammoth Pike twenty years ago in a bookshop in County Cork, bought a copy, fell in love with it, lent it, lost it, mourned it and found another in a sale of Ron Coleby’s effects. On the flyleaf Fred had written, ‘as a small token of thanks, for much help’ – anyone who knew Ron will realise how heartfelt that sentence must have been. I have the book on my lap now as I type, a Pandora’s box in printed form that rekindled my interest in pike and led me to spend many hours scouring Loch Oich for the big one. But that is another story. For years and years and years and years and years, everybody who has loved the Domesday book has been urging Fred to get on and write a sequel, because you can only cram so much magic into one volume. Fred’s response appeared to be one of masterful inactivity, but the still waters of that man run deep, because here is not only the long desired sequel, but a book into which twenty five years of research and patient detective work has been distilled, and one which is almost as magical as the original. No, I take that back, it is more magical, because instead of the constrained layout of the original, the better stories have been allowed to sprawl across as many pages as they deserve, so that that the brief paragraph of William Conlon’s thirty eight and a half pounder on page 70 sits atop the right shoulder of the man and his fish, a fish so large that its tail slaps against a reference note about Pat Connor’s pike on page 71. 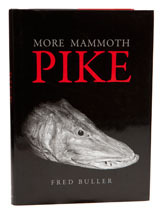 Then we get a page and a half of new information about the Parton Station pike (page 58 in the Domesday book)… and then there is a long tale of chaos about Parrot’s pike, which may well have been netted, the tinkers. Definitely a classic - and about £365 cheaper than a first edition of the Domesday Book.